A large and well-specified controller with great build quality and a useful standalone mixer. Traktor software included. Standalone four-channel DJ mixer. Sturdy metal case. Controls layout/aesthetics can be confusing. Fixed USB cables. In recent years the DJ controller market has been growing at an ever-increasing rate. More and more DJs are trying to harness the power of sophisticated software, such as Native Instruments Traktor and Serato Itch, to give their performances an edge, and veteran DJ equipment brand Numark has not missed out on these developments. Its latest offering promises to be one of the most powerful and feature-packed controllers yet. "Numark's latest offering promises to be one of the most powerful and feature-packed controllers yet"
As the quirky spelling suggests, the Numark 4Trak has been designed with Traktor in mind. At its heart is a four-channel mixer surrounded by an abundance of knobs, buttons and faders that are used for MIDI control. The case is made of metal and feels very sturdy, but at 7.17kg and more than 60cm wide it isn't the most portable design. It would be fine for travelling to a gig by car, but we wouldn't like to try and carry it as hand luggage. That said, this does mean that the overall build quality is good, and there's plenty of space for all of the controls. If you've been shopping for DJ equipment lately you may have a sense of déjà vu when looking at the 4Trak. 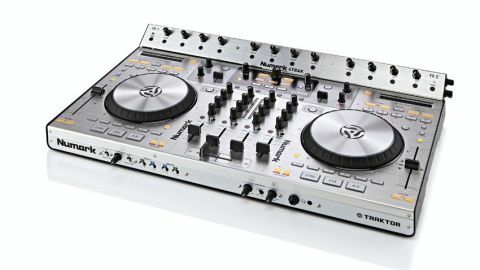 This is because the main unit is exactly the same as the Numark NS6, except with a silver finish rather than black. The labelling of the buttons has been updated to reflect the terms used by Traktor, but the layout remains the same. As such, it's not quite as natural to use as the Native Instruments S4, which has been designed to more closely mirror the software. The slightly unusual angled FX control panel is detachable, which makes it seem like an afterthought, but once secured in place it's stable enough and feels like a part of the main unit. A short USB cable connects the FX section to the main unit. This looks a little untidy and it's also a slight reliability concern as the USB cables are fixed into the FX section, making replacement difficult. The channel filter knobs (with bypass buttons) are also located on this panel, which works fine, but seems a little less logical than having them next to the EQ. In order to work with DJ software the unit incorporates a four-channel sound card. It sounds good, but only supports a sample rate of 44.1kHz. The Mac OS X drivers worked well for us, and there is also a copy of Traktor included. The two decks are bristling with controls and are based around large six-inch jogwheels, with a smooth but slightly weighted response. They transmit high resolution MIDI and work well for scratching and cueing-up. A light on the edge of the platter indicates its position and also shows which of the four decks are currently selected. Finally, the tempo fader is long-throw and has a nice heavy feel that is reminiscent of Technics 1210s. We also liked the comically named Strip Search: a touch-sensitive strip that allows you to jump straight to any part of a track, similar to that on the CDJ-2000s. A row of LEDs gives visual feedback and Numark have programmed this to only work when the shift button is pressed, in order to avoid any embarrassing accidents when reaching for nearby controls. One of the strong points of the 4Trak is the built-in mixer, which works in standalone mode, no computer required. This has pretty much everything you could ask for including two phono inputs to cater for vinyl lovers. The three-band EQ is effective, with full kill capabilities, and there is a dedicated booth output with level control, a feature sorely missing from competitors like the Pioneer DDJ-T1 and NI S4. "The 4Trak's strong suit is its full-sized layout, tank-like build quality and comprehensive standalone mixer capabilities"
Faders all feel high quality and the crossfader has an adjustable curve. Finally, the 12-segment LED output meters are nice and clear, but it's a shame that they only show the master level and cannot be switched to display the cue level as well. Although not quite up to the standard of dedicated high-end mixers, the sound quality is good, and it's useful to know that the 4Trak can be the centrepiece of a larger DJ setup incorporating CDJs and vinyl. One minor criticism of the 4Trak design is that there are a lot of buttons with similar colours and shapes. This can make it difficult to find a specific control in the dark, or in the heat of a mix. The problem is compounded by the layout, which is a little busy in places. It's certainly not as bad as many compact designs, but it does mean that occasionally you may find yourself reaching for a control in the wrong place. There's some strong competition in the four-deck Traktor controller market, not least from the NI S4, which has the advantage of coming with the full version of Traktor Pro, plus the ability to upgrade to timecode capability. Where the 4Trak is strong however, is in its full-sized layout, tank-like build-quality, and comprehensive standalone mixer capabilities. If these are important to you - and they'll have to be important at this size and weight - then it's a great option. Anyone needing something more compact will need to look elsewhere.